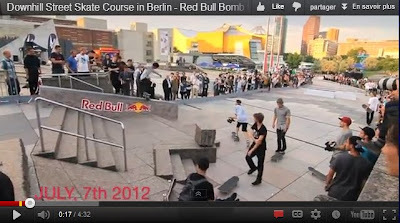 Red Bull Bomb the Line, the first sloped best line contest worldwiede with 50 of the top skaters from all over the globe, went down on July 7th, 2012 in Berlin! Are Red Bull and Monster becoming the greatest supporter of skateboarding? Seems so. Red Bull has organized the Red Bull Manny mania for some time now and has sponsored some of the best bowl riding events of the season, including the contest in Florianopolis, Brazil, at the home of Pedro Barros. Red Bull is now organizing a brand new banging looking contest in Europe. Red Bull Bomb The Line skateboard contest took place in Berlin's famous street spot 'Kulturforum' and added a little spice for the skaters. The concept is almost the opposite of Red Bull Manny Mania as skaters were able to cruise down the course putting together lines instead of a ton of flatland pushing. All hail the king! It´s done. The "Baustelle" has a new regent. In the biggest session the world-famous street spot "Kulturforum" has ever seen, 50 skateboarders from 15 nations were fighting for the crown. The downhill course was certainly a skateboarder's paradise. The Australian Shane O´Neill, came, saw and won -- with an incredible combo of a nollie nosegrind at the long hubba, a perfect switchflip out of the kicker and a nollie backside heelflip at the stairs. Some of the contestants were Lem Villemin, Philipp Schuster, Shane O’Neill, Chris Pfanner, Benny Fairfax, Abbe Nyberg, Alex Mizurov, Marek Zaprazny.